Freediving Stereofins Carbon blades are designed for advanced freedivers. 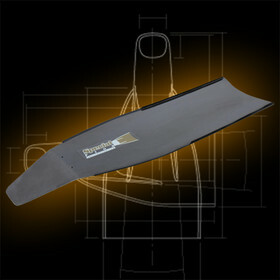 The blade of our Carbon fins is very 'alive' and very durable (covered with special protection layer). As material we use hand-laminated multilayer mixture of carbon, resins and other chemicals, which are vacuum processed. Order-based processing allows to modify blade stiffness according to your own personal needs. Stereofins Carbon have an angle in front of the blade, which helps you to increase the efficiency of your kicking technique. Blade measures (width x lenght): 195x805mm. Total lenght depends on the foot-pocket size. You can choose within 4 stiffnesses. You can order the blades for your favorite foot pockets! Freediving fins come with a two-year warranty for materials and craftsmanship.